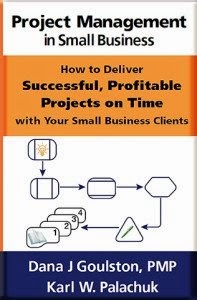 Long time author, trainer, coach, and community builder Erick Simpson is teaching a great new 3-part mini course in the Small Biz Thoughts Community on DiSC personality profiles. Many of us use DiSC profiles at some point in our hiring process. Personally, I used them when I think I’ve got the right candidate, but before I make the actual job offer. Erick learned about DiSC profile while running his own managed service business. He saw so much value for his team that he became a certified DiSC trainer and started offering DiSC training to other. In this three-part mini course, Erick gives you a great introduction to the value of personality profiles and lots of hands-on knowledge so you can learn to apply these profiles within your own company. NOTE: Your class registration includes ONE DiSC profile, which will give you a big fat report you can read through to see the value of the instrument. Additional profiles are available at a greatly reduced price. Format: Our Community presents a new 3-part mini class every month. Each class is about 30-60 minutes with 100% usable information. 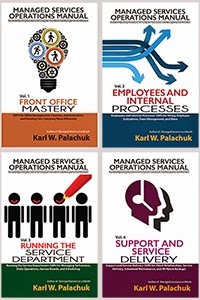 Our goal is to give you truly valuable tools and education that will improve your business during the class. 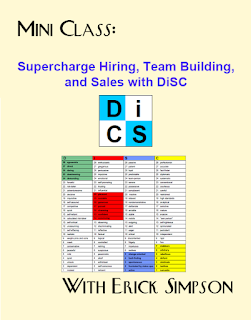 You will certainly benefit from Erick’s training on DiSC profiles! This class is FREE for Small Biz Thoughts Community. Community members. $99 for non-members.